Smorgasbord Health 2017 – Cook From Scratch with Sally and Carol Taylor – Brussel Sprouts. Posted on September 13, 2017 by Smorgasbord - Variety is the Spice of Life. Welcome to our weekly post where I look at the health benefits of my favourite foods and Carol Taylor provides delicious recipes so that you can include these foods in your diet. Brussel sprouts are not necessarily the most asked for vegetable by children as they do have a slightly bitter taste (actually the healthy element of the Brussels), but if you prepare them following Carol’s guidance, they should be a hit with all the family. Variety is the spice of life….and our bodies need a wide variety of foods to extract all the nutrients it needs to be healthy. We are just coming into the Brussel sprout season and I shall be taking full advantage. I eat cabbage all year round, but Brussels are so much easier to prepare and are a powerhouse of benefits all on their own. The Brussel sprout is a miniature cabbage and is usually in season from the early autumn to early spring, but today you can find them all year round in most supermarkets. They are, like most fruit and vegetables, at their best in the actual growing season. We eat most of our fruit and vegetables seasonally, and apart from anything else it does encourage you to widen the spectrum of types of foods that you eat and therefore gives you access to a much broader selection of nutrients. One of the things that I encouraged my clients to do before coming for their first consultation, was to complete a very extensive questionnaire with two week food diary. A food diary is not about calories and fats consumed but does identify either food groups that are being excluded and also any important nutrients. It is easy to slip into a routine with food. You are busy; a family to feed and it is more convenient to eat the same meals in rotation. Monday pasta dish, Tuesday shepherd’s pie, Friday fish and chips, Sunday roast chicken, potatoes, carrots, peas etc. It is not so much what you are eating but what you are not eating by adopting this regular pattern. Brussels are related to both the cabbage and the broccoli families but have some very distinctive properties that make them an essential ingredient of any healthy eating plan. Onto the main business of the day! The Brussel sprouts are related to both the cabbage and the broccoli families but have some very distinctive properties that make them an essential ingredient of any healthy eating plan. Our immune system is very efficient but life takes its toll. It is important that in our diet we include foods that enhance and boost our immune system and the Brussel sprout does just that. Brussel sprouts contain a phytochemical, which helps our own defence system to protect against disease in general but in particular cancer. Sulforaphane is a phytonutrient found in this group of plant families, and it helps boost the body’s detoxification enzymes, which help clear carcinogenic substances from the body quickly and efficiently. Brussel sprouts have also been shown to decrease the level of DNA damage in cells, which prevents mutations in the cells, which allows cancer to develop. To get the benefit of this phytochemical the food needs to be chopped or chewed so that the liver is stimulated into producing the specific detoxification enzymes and research has shown that breast cancer cells particularly are prevented from reproducing even in later stages of the disease. Apart from cancer the Brussel sprout and other members of the Brassica family such as cabbage, cauliflower and broccoli contain large amounts of vitamin C. This supports our immune function and has been shown to help prevent heart disease, strokes and cancer but also promotes the manufacture of collagen, a protein that forms the body structure including the skin, connective tissues and cartilage. A serving of Brussel sprouts also contains very healthy quantities of Vitamin A and beta-carotene, both vital in defending the body and promoting healthy and young looking skin. Folic acid has long been recognised for its ability to help protect the foetus against birth defects. Folic acid is a B vitamin that promotes healthy cell division. Without it nervous system cells do not divide properly which has linked to a number of birth defects such as Spina bifida. The main source of folic acid is green leafy vegetables such as the Brussel sprout and spinach but as our reliance on processed foods rather than fresh fruit and vegetables grows, the deficiency of this vitamin is becoming the most common in the western world. Apart from being rich in fibre, which helps protect us against colon disease this vegetable, because of its high content of antioxidants, particularly vitamin C, is a great preventative for degenerative diseases such as rheumatoid arthritis, the subject of our disease report this month. On Monday I posted about Chicken Pox and Shingles and the importance of the amino acid L-Lysine to assist in recovery from an attack of the latter. Brussel Sprouts are one of the leafy green vegetables which contain this amino acid and another good reason to include in our diets. I am now going to hand you over to the ever resourceful Carol Taylor to share some delicious ways to prepare and eat this very versatile vegetable. 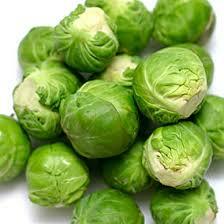 Brussels sprouts or little cabbages fall in two camps love them or hate them a bit like Marmite. I wonder how many parents have cajoled, bribed or just said eat it or you get it for breakfast?? How many people who hated them as a child now love them? As Sally has rightly stated in her part of the post they are packed with good things…Like a phytochemical, which helps our own defence system to protect against disease in general but in particular cancer. Vitamins A and C and so much more. Eaten as part of a varied diet and now they are not boiled to death like my Nan used to do with anything green they are roasted, Sautéed, fried, shaved as well as steamed or boiled in lightly salted water. In my quest for some different recipes I did come across Brussel sprout ice cream…I love the little sprout but for me that is a step too far…Some veggies don’t lend themselves to ice cream or smoothies. I love just plain little brussels lightly steamed or boiled with my Christmas dinner…the little small ones which have had had a frost on them are so sweet and lovely. Chilli flakes and chopped fresh chives to garnish. Heat the olive oil in a frying pan, add the garlic and shallots and stir fry for 3-4 minutes until the shallots just start to turn golden. Sprinkle in the cumin seeds and add the sprouts. Stir fry for 3-4 minutes over a medium heat then reduce the heat and cover the pan, cook for a further 4-5 minutes or until the sprouts are almost tender. Sprinkle over the balsamic vinegar and let it cook just for a few seconds. Season the sprouts to taste with salt and cracked black pepper. Garnish with chilli flakes and chopped chives. A beautiful side dish with your Sunday roast or Christmas dinner. These little cakes are very tasty and lovely with some steamed vegetables or a salad. This mix makes 6 rice cakes. If you haven’t made a risotto before please don’t let it put you off. As long as your liquid is hot and you let each addition of stock become absorbed into the rice before adding more stock it is a doddle. So much easier than most people think it is. Who hasn’t seen the disasters on the TV cooking shows? Risotto Cakes with Brussel Sprouts. These lovely risotto cakes also are vegetarian and the first time I made them was at Christmas for a veggie friend and they loved them. I also think meat free dishes have come a very long way…Don’t you? There is so much more on restaurant menus and I also think home cooks are more adventurous with flavours. These risotto cakes certainly fit the bill even if you are a die hard meat eater. 15-20 Sage leaves for garnish, a little flour for dusting and a pinch of paprika. Oil of your choice for deep frying. Line 6 x 4 inch cooking rings with cling film. Cook the shredded Brussel sprouts in lightly salted water for 1 minute. Drain set to one side. Melt the butter in a pan and cook the shallots for 2 mins until soft but not coloured. Add the rice and stir until the rice is evenly coated with the melted butter. Stir in 1-2 ladles of the hot vegetable stock at a time and stirring until the rice has absorbed the stock before adding your next ladles of stock. Do this until the rice is just tender but with a little bite. This will take about 25 minutes as does any risotto. Add the cheese and season being careful of the salt as both the cheese and the stock contain salt. Gently stir in the chestnuts and the sprouts. If the mixture seems too thick then you may want to add a little more stock. Divide your mixture between the cooking rings. Leave to cool and then chill until set and firm. When the rice cakes are nicely chilled remove the rings and the clingfilm. Double dip the lightly floured rice cakes in egg and then breadcrumbs…repeat. You may need to reshape the cakes. Heat the oil until a small crouton of bread turns golden within a minute and dust the sage leaves with the flour and paprika and fry for 1-2 minutes…set aside on kitchen paper. Deep fry the cakes for 5-7 minutes until they are golden and crisp. It is probably best to do these 2 at a time while keeping the cooked ones warm in the oven. To serve, add some deep fried sage leaves to the top of the cake and serve with steamed vegetables or salad. Brussels also lend themselves very nicely to salads I think we are all getting so much more adventurous with food…Don’t you?? This salad has all of my favourite things in one beautiful bowl. 2/3 cup fresh or dried cranberries…I prefer fresh just for that little zing…No cranberries try blueberries. 2 tbsp maple syrup not pancake syrup as it will not taste the same you can’t beat proper maple syrup. Hold the core end of a brussel sprout and, starting at the top, slice it into very thin slices. Discard the core and chop remaining brussel sprouts until they are all are thinly sliced. Place chopped brussel sprouts, cranberries, pecans, apples, bacon, onion and feta in a large bowl. Put all of the dressing ingredients in a lidded container. Place a lid on the container and shake well. Pour desired amount over the salad, a little at a time, until the salad is coated. Store any leftover dressing in the fridge where it will keep for a few days. It can also be made in advance. I don’t like to dress my salads but put dressing on the table as I think everyone’s taste varies. I do have a lovely recipe for Brussel sprout soup but you can overdo the soup recipes(let me know) if you would like it. This au gratin recipe is quick to do and very nice as a side dish. Preheat your oven 400F and grease a 2 quart oven dish. Bring a pan of water to the boil and add brussel sprouts, cook for 6-8 minutes, drain and coarsely chop. While the sprouts are cooking put the bacon in a cold pan(no fat), heat and cook for a few minutes, take out and drain on kitchen paper. The bacon will carry on cooking and you will have nice crispy bacon. I learnt this on master chef and it works..bacon needs no fat as it makes it own and if you cook it until it is crispy in the pan as it carries on cooking you will then have very dry crispy bacon…I know because I always did that to mine until I saw it on master chef and it works a treat. Put the sprouts and half the bacon into your prepared dish and sprinkle with red pepper flakes..Spread the mixture over the dish and pour your cream over the top. Sprinkle the top with your breadcrumbs, cheese and the remainder of the bacon. Bake for 15 minutes until it is bubbly and golden. I hope you have enjoyed our collaboration and even if you don’t like sprouts I hope these recipes tempt you to try them. I think they really are an underrated little vegetable which maybe as a child we didn’t like and have never tried since…You may be pleasantly surprised. Until next time stay safe, have fun and laugh a lot ..Because it is proven to be the best medicine and it is FREE! My thanks to Carol for elevating this small vegetable to its rightful place on all our plates.. This entry was posted in Cook from Scratch with Sally and Carol and tagged Birth defects., Brussel Sprouts health benefits., Brussel Sprouts Recipes, Folic Acid., L-Lysine and shingles by Smorgasbord - Variety is the Spice of Life.. Bookmark the permalink. Love me some Brussels sprouts! And I like all these inventive recipes. I cook them simply; I halve them lengthwise, lay them flat on a cookie sheet, coat them with olive oil and salt, then bake them for about 10 minutes. And they’re grown up the coast from Santa Cruz, so I always get them fresh. Fantastic and great recipe Robert and will give that a try. Precisely! If I am eating brussels… this is exactly how I am eating them! Sprouts! You know you love them! Or do you???? I hope that after you have read the health benefits that Sally has presented for you and perused the recipes that you will be tempted to try them…They are coming into their season now and are at their best, so easy to prepare and cook…Enjoy! Honestly, I have always hated cabbage and Brussels sprouts. I have never understood the English obsession with these. That being said, these recipes look wonderful and changing one’s ways is always a possibility, isn’t it? All of the recipes look yummy. However, I have all the ingredients for the first one, including cumin. After the post-hurricane recovery, I should try the easiet one – for sure! Thank you, Carol and Sally. I’ve just added a bowlful to a vegetable stew I’m cooking – love the depth of flavour they give to soups and stews. I love Brussel sprouts and will definitely be trying some of these recipes. PS Carol, I also saw the bit on Masterchef on how to cook crispy bacon! The Risotto Cakes with Brussel Sprouts sound delightful! YUM.